Proper drainage is essential to ensuring that you don’t experience water damage either inside your home or out. If water collects somewhere on your property, it could seep into your basement and cause a variety of problems, including mold growth or rot. Without proper drainage, you might also experience an overflow of water in your yard, leaving it soggy and unattractive. If you are experiencing either a wet lawn or a wet basement, French drains are a very simple and effective way to resolve the problem. What Is A French Drainage System? A French drainage system is a very common method that homeowners use to move water away from their home. The process simply involves digging a sloped trench (that is, digging the slope in the direction you want the water to travel) alongside your property and then adding a drainage pipe into the trench. After this, you simply cover the drainage pipes with gravel and place filter fabric on top of the gravel. 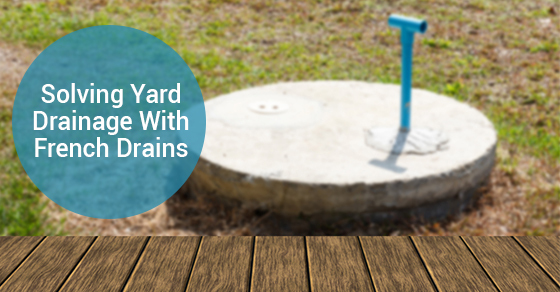 The drainage pipes work by moving water away from your home and into a better location, such as a rain barrel or storm drain. Old methods simply skipped the gravel (and the fabric) but these two things are important in preventing clogs due to a build-up of soil and other debris. You can choose how far away from your home you want to divert the water. It provides attractive landscaping for your home via the gravel and decorative rocks that are used. It doesn’t require a lot of installation, making it very cost effective. Contact a professional after you have completed the project to ensure that you have done everything correctly to prevent further damage and/or potential problems in the future. If you are purchasing a home with a French drainage system, it is recommended that you have it professionally inspected. Since many homeowners take on the task of installing a French drain themselves, it is important to ensure that the process was done correctly.